The dealer wanted to make a throwback to the '70s Plymouth Barracuda convertibles. If the car that you want doesn't exist, you have to do your best to bring the dream to life. 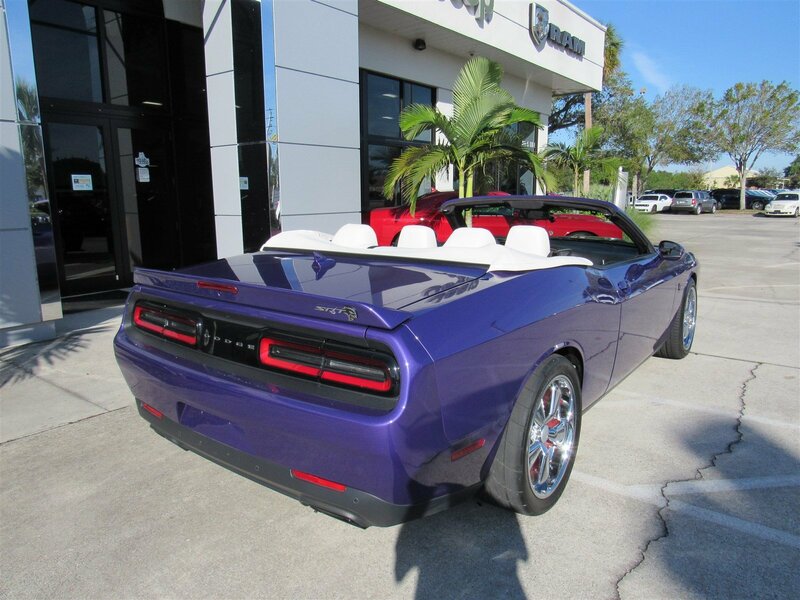 One Florida Dodge dealership wanted to make a convertible out of a 707-horsepower Dodge Challenger Hellcat, so it commissioned an award-winning custom shop to make it happen. 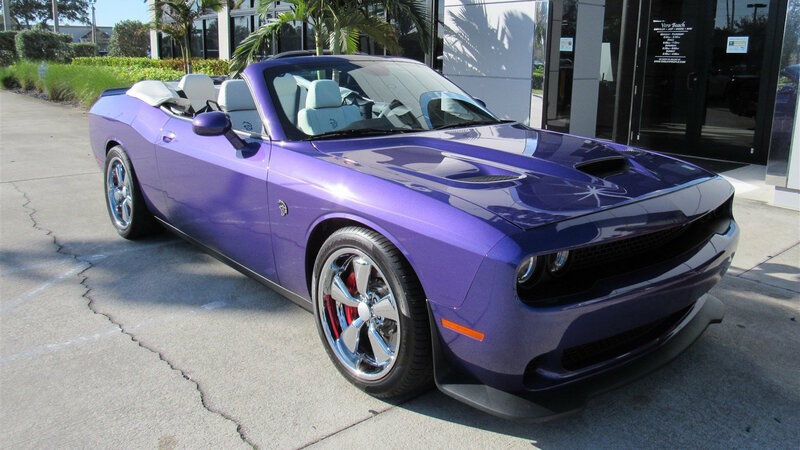 Jay Campana, a dealer principal at Vero Beach Chrysler Dodge Jeep and Ram, wanted a Hellcat that could serve as a throwback to the days of the early '70s Plymouth Barracuda convertibles, so he sent a 2016 Plum Crazy Purple Challenger Hellcat to customization shop Drop Top Customs in High Springs, Florida to get the job done. The car came back with a redone interior—white leather interior with Hellcat emblems stitched in—and a fully retractable soft top. "We tried to go back to old school," Campana told The Drive. During the customization process, the Hellcat's black trunk spoiler was painted to match the body paint and the black fuel door was replaced with a chrome piece, the dealer explained. The car also has wider Nitto drag-ready tires in the rear, a front strut brace, a brace in the trunk, and 20-inch Cragar wheels all around. Campana said that though the dealership doesn't have an exact weight for the open-top car, he believes that with the new roof mechanism, the Hellcat weighs around 150 pounds more than it did when it rolled out of the factory. 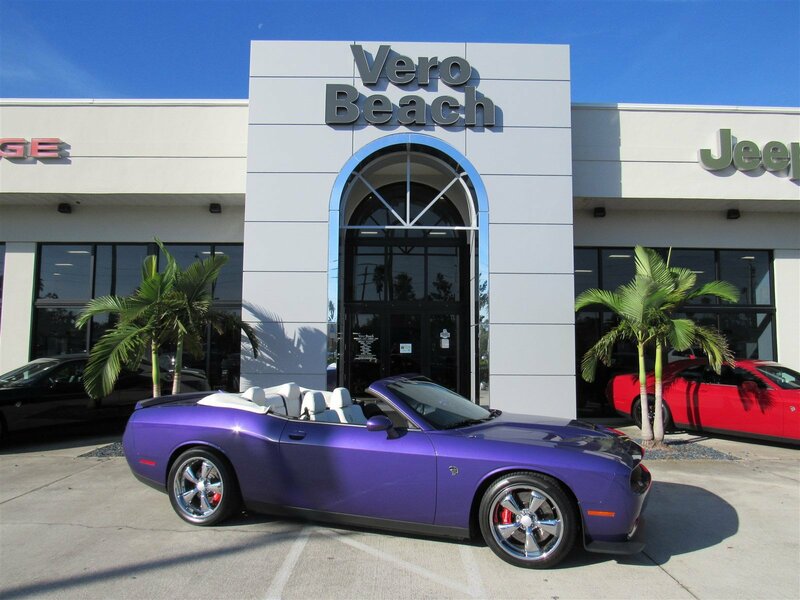 It's the first time the Vero Beach dealer sent a Hellcat out to be convertibilized, but the car seller said it's not something it would be opposed to doing again in the future. According to a comment on the Drop Top Customs Facebook page, the conversion to turn a Hellcat into a convertible costs $18,000 and takes about three weeks to complete, and the Hellcat itself starts at about $65,000 after destination charges. The dealership's car served as Campana's personal car and now has around 2,000 miles clocked in, but is available at the dealership for about $90,000. But remember, if you get that car, you don't have to wait for the build to be complete...and it has a fully redone interior. Check out the custom build below. CHP will be replacing 580 old units with the popular Dodge Charger Pursuit. The Hellcat gets the jump off the line, but the CTS-V quickly shows Dodge who is boss. It's not the first Dodge Challenger to use forced induction...but this is the first time Mopar has quoted Metallica in a press release, as far as we know. But does the form suggests a new styling language for the new Continental GT?